Burnsville, MN – WeddingBands.com released a new sizing convertor and calculator that allows international customers to calculate their U.S. ring size. The simple to use convertor and calculator converts sizes from six different countries as well as diameter and inner circumference and can be found on the Ring Sizing Help page. WeddingBands.com hopes to make it easier for international customers to know which U.S. size equals the sizes internationally. The ring size application takes into account American, Japanese, British, French, German, and Swiss sizes. Even people who know the diameter of a current ring or have measured the circumference of their finger can use the tool to find their U.S ring size. Another feature of the application is the ability for other websites to take the code and use the application for their own website. It is customizable with nine different colors and two sizes, so it will fit a multitude of website designs. To use the application, visit the Ring Sizing Calculators Page and customize the ring sizing application. After the desired look is attained, copy the script on the right and paste it into any section of a website. WeddingBands.com has been in business as brick and mortar since 1985 and online since 2001 selling wedding and anniversary rings. The site offers timeless, unique designer jewelry. They design and manufacture an exquisite selection of platinum, gold, titanium and/or palladium diamond wedding rings and wedding bands. Follow WeddingBands.com on or like the Facebook Page. July 6th, 2012, Burnsville, MN- WeddingBands.com, releases two new categories making product browsing easier. The online retailer for wedding rings added the sections Men’s Wedding Bands and Women’s Wedding Bands today. The two categories allow shoppers to search along gender lines for the first time in the company’s history. Since the inception of the website, the company has always stated that all the rings on the site are unisex. While the company still believes this, the new gender categories will provide guidance to shoppers who are overwhelmed by the sites 7,500+ ring styles. Within the two new sections, shoppers can still search, metals, styles, and even widths. In addition to making the site easier to use for shoppers, the men’s and women’s wedding ring sections provide a new look for the site. Where as products in the past, were always the main showcase of images on WeddingBands.com, the site is branching out and using images not only based on their products. Future plans for additional sections include metals, and an increased organization of the diamond wedding and anniversary rings. Allowing guests to search by diamond shape, carat weight, and quality. WeddingBands.com has been in business as brick and mortar since 1985 and online since 2001 selling wedding and anniversary rings. The site offers timeless, unique designer jewelry. They design and manufacture an exquisite selection of platinum, gold, titanium and/or palladium diamond wedding rings and wedding bands. It is said a wedding band has no beginning or end, which represents the boundless love and devotion that a marriage provides. With such massive responsibility tasked to a tiny ring, it’s no wonder shopping for the perfect ring can be stressful for bride and groom. However, the right guidance makes this tradition not only hassle-free, but save you cash in the process. Below you will find six tips that will help your search for the perfect wedding ring. This will not only save a lot of back and forth sizing and resizing but it can help cut those costs. Knowing your correct size is the first piece of information needed when buying your ring. WeddingBands.com offers a free ring sizing kit to anyone who wants to size their finger from home. A proper fit for a ring is for the ring to go on with ease, and come off with some resistance. The ring should be comfortable on your finger, but if you’ve never worn a ring before, it may take a couple of days to get used to the ring. 2.) Comfort fit vs. Non-Comfort Fit. The differences between comfort fit and non-comfort fit rings are minuscule in features but massive in characteristics. Comfort fit wedding rings are about a millimeter thicker all around the ring and have a curved edge to them so less of your finger makes contact with metal. This modification makes a world of difference in weight, price, and comfort. Comfort fit bands are heavier rings to achieve the desired effect. The extra metal means that the rings are heavier, more costly and more comfortable, which is more so the wider the ring. A non-comfort fit ring will save you money, if you are on a budget. 3.) Find the metal that fits your style and feel. Everything that sparkles in jewelry is not gold. While the vast majority of wedding rings still sold are made of precious metals like gold and platinum. Recently alternative metals such as palladium, titanium, tungsten, and stainless steel have increased in popularity. Both traditional and alternative metals have their benefits and detriments. Gold, palladium, and platinum will last longer, while titanium, tungsten, and steel are budget friendly alternatives. The material your ring is made of can determine not only the cost, but also the weight, color, and overall style. Whether you want a shiny, brilliant or a dull, matte look your metal choice will play a large part in this. Another piece to this is the finish of the metal. 4.) Know the metal finish that best fits your style. Every ring style can an infinite number of looks just by changing the finish of the metal. The finish can range from a basic high polish to a hammered finish and everything in between. A wedding ring’s style can be customized through the metal’s finish. A matte, sandblasted finish can make a plain ring more dramatic. A Florentine or brushed finish can ensure small scratches never show. Look through all the possible finishes and talk to your jeweler to ensure they understand the look you want. 5.) Know your diamonds and the 4Cs. Usually you would see this tip for engagement rings. However, diamonds in wedding rings are seeing a resurgent in the last 5 years so it is important to know what kind of diamonds you are buying. The 4Cs of diamond buying are simple enough in concept; color, cut, clarity, and carat. Details of each get confusing due to fact that we assign massive value difference to tiny differences in rocks. To keep it simple for your sanity follow this simple guide. Everything VS in clarity or better looks the same to the naked eye. Some jewelers use lower clarity and charge the same as though they are higher clarity. Make sure you know what you are buying. You cannot tell the difference between colors H to D when set in a ring. The cut of a diamond is the shape, symmetry, and polish the diamond is, which in smaller diamonds are less of a factor. Just make sure it is the shape you want it to be. Carat is the weight of a diamond and total carat is the total weight of all the diamonds in the ring. 6.) Make sure to value features of a retailer before making a decision. You can buy the same ring at two retailers for the same price. If one retailer offers free delivery, ring sizing, lifetime warranty, a return policy, a ring box, and an appraisal with the purchase, and the other does not, they are not equal in value. Make sure when you buy your ring that the retailer include ALL of these features. It will save you time, money, and headache. Most established, well-known retailers will supply their customers all of these. WeddingBands.com Launches Larger Diamond Anniversary Rings and Eternity Bands Lines. Burnsville, MN based WeddingBands.com announces the launch of a new diamond anniversary and eternity band collection. The new collection is made up of larger more expensive pieces due to rising demand of jewelry with a larger total carat diamond weight. The new ring line start at 2.50-carat total weight and increases from there. It incorporates diamonds that are a minimum of Very Slightly Included in clarity and near colorless at G/H in color grade. 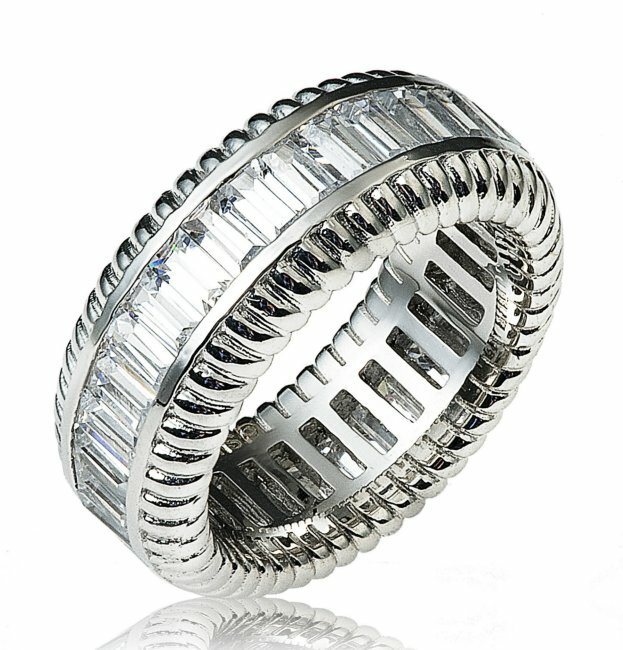 The largest eternity band in the line starts at $16,950 USD and is 5.10-carat total weight (pictured here). “Our customer base in Australia and the United Kingdom’s want for larger pieces increased over the last year. We hope that this new line satisfies that demand”, stated Operations Manager, Edessa Kerkinni. The new line is the start of a company wide initiative to build on their reputation as an online wedding band retailer and start catering to tastes for larger diamond jewelry. WeddingBands.com’s team of designers and artisans is in current works to create a ring by the end of summer 2012 that will start at $100K. The new higher priced anniversary rings are already online and selling, giving WeddingBands.com a range of rings starting from $90 to $16,950 USD. WeddingBands.com has been in business as brick and mortar since 1985 and online since 2001 selling wedding and anniversary rings. They offer timeless, unique designer jewelry and manufacture a large selection of wedding bands. Burnsville, MN based WeddingBands.com announces the launch of their new mobile website. In development over the last six months, the mobile version cleanly organizes the site’s information for uncomplicated viewing and research. It also incorporates new touch screen search features that allows guests to peruse the over five-thousand wedding bands and anniversary rings with ease. The mobile search uses simple touch buttons to choose ring categories and metals, as well as a slide bar to select price points. Categories include plain wedding bands, classic wedding bands, contemporary wedding bands, anniversary bands, diamonds diamond wedding bands, handcrafted wedding rings and eternity rings. Wedding bands matching the results update seamlessly for the user, making browsing the large selection of wedding rings with one hand. WeddingBands.com hope the new mobile site will allow them to keep up with the growing trend of searching and buying on the go. The site’s mobile users, which has grown to 25 percent of total traffic over the last year, now have the ability to research wedding bands in a more user friendly manner.